There is plenty of good news knocking around the UK recorded music business today, with the revelation that the market’s annual retail revenues grew by over £100m in 2017. That, of course, is largely thanks to subscription streaming platforms, which generated £577m ($743m) in the UK in 2017 – up 41.9% year-on-year. There were declines, however, in the amount of cash taken at retail by physical formats (-3.4%) and, more severely, by downloads (-23.1%) which in 2017 attracted less than half the annual UK spend they did as recently as 2014. Further numbers provided today by the BPI, based on Official Charts Company data, reveal how harshly these sales drops are specifically hitting the album. Last year saw 45.8m physical album (ie. CD and vinyl) sales and 13.8m digital album sales. Combined with other niche formats (cassette, minidisc etc.) that created a cumulative annual album sales total of 59.7m. 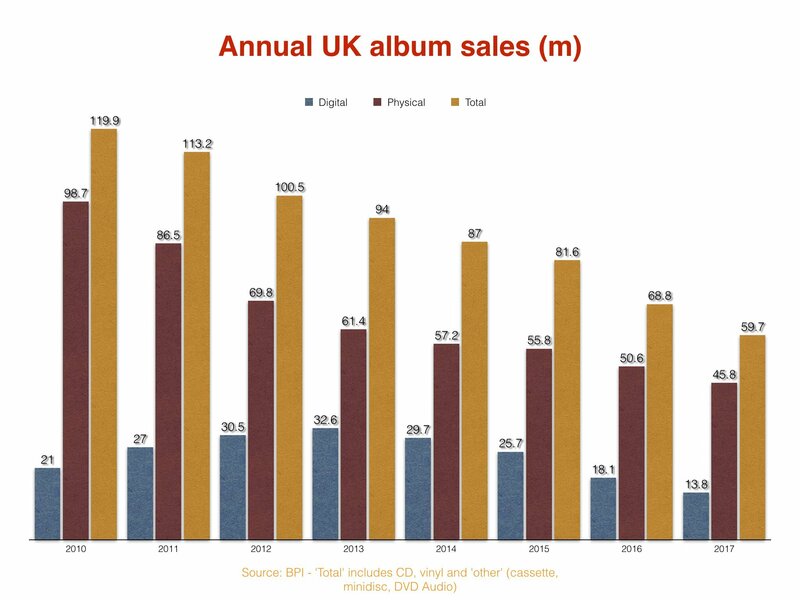 That’s less than half the number of albums sold in the UK market in 2010 – clearly showing the damaging effect the rise of Spotify, Apple Music et al have had on the format. Digging further into the figures demonstrates the specific, respective plight of the digital and CD album market. That was down 46% on the 25.7m digital album sales recorded in the UK in 2015. Within the physical album sales noted above, CDs accounted for 41.6m in 2017, down 12% year-on-year. Vinyl, however, continues to grow. There were 4.1m sales of vinyl LPs in the UK last year, up nearly a million year-on-year, and nearly four times the 1.3m annual sales seen as recently as 2014. In the background of this performances, of course – driving the industry’s revenues upwards – is streaming. 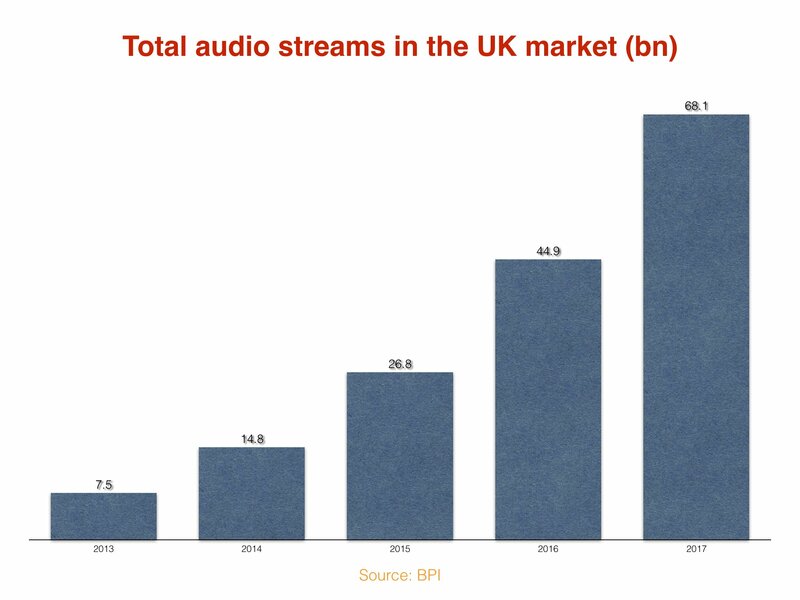 On a unit basis, the UK saw a total of 68.1bn audio streams last year across services such as Spotify, Apple Music and Deezer. That was up 51.5% on 2016, and up by a staggering 1,740% on the same figure in 2012. “Whilst the rapid growth of streaming and resilient demand for physical formats gives us confidence for the future, it is important to remember that the music industry still has a long way to go to recover fully. Structural challenges must be overcome if long-term growth is to be sustained.